It felt a bit strange to walk into Sneha, the nondescript, no frills, yet very popular 30 year old Keralite eatery in Mahim this Wednesday evening. I had a job to do. I was carrying a trophy which had to be given but the restaurant looked pretty busy and disturbing the staff didn’t seem right. Mr Prabhakaran, one of the managers of Sneha, later told me that they used to be more crowded on Wednesday evenings. That people would attend the Noveena or Wednesday mass at the nearby St Michael Church and then come here for beef fry and porota and the beef kappa biryani. ‘It used to be houseful’ said Mr Prabhakaran, ‘now empty’. 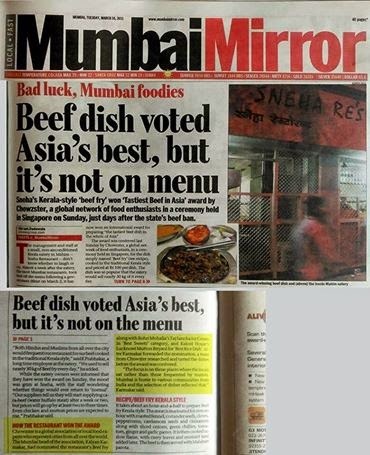 Beef is off the menu now and its fans have stopped coming to Sneha. Sneha used to serve beef earlier though it was not mentioned in the menu towards the last few days. The regulars knew about it and didn’t need a menu to order from. With the recent beef ban, the beef dishes have gone off the menu. 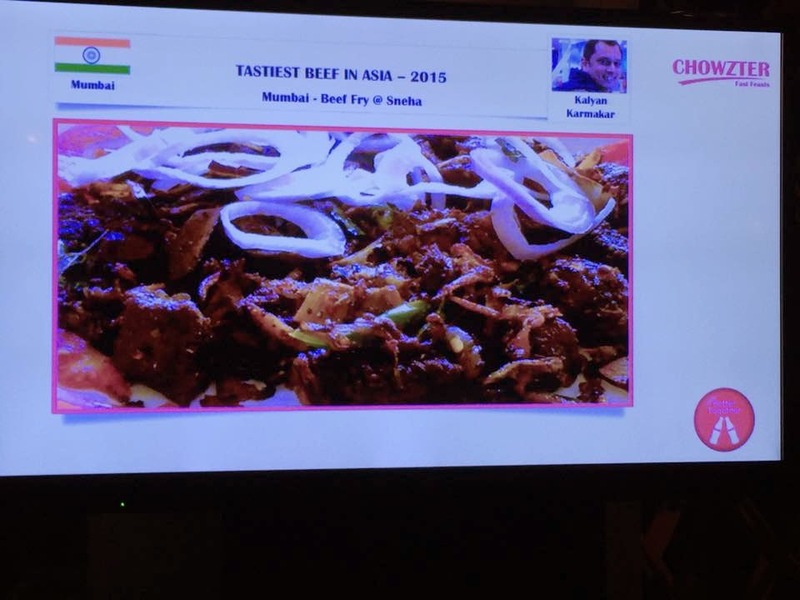 Which is ironical since a couple of days after the beef ban, the beef fry in Sneha was announced to be The Tastiest Beef inAsia in the first Chowzters Asia Pacific Fast Feast Awards. It beat stiff competition from Adelaide, Jakarta, Manila, Seoul and Tokyo to put Mumbai on the world food map. Mr Devender, the owner of Sneha was not around, so I gave the trophy to Mr Prabhakaran. Sadly enough, the award winning beef fry is no longer available. The dish which consisted of tender slow cooked beef, enrobed in a mix of spices, its taste a medley of the sweetness of carmelised onions, the heat of green chillies and the distinctive flavour of curry leaves, went beautifully with porotas. Now we can only reminisce about it. Chef Kareem, originally from Karnataka, smiled wryly when I told him about his achievement. Mr Prabhakaran said that the pricing of beef (Rs 150 a kilo at its highest when available versus Rs 420 plus for mutton) made beef dishes affordable and popular. I asked him if what was served as beef was bullock or buffalo (cow slaughter was already banned in Mumbai since 1976) and he replied that he didn’t really know. Newspaper reports suggest that bullock is banned too while carabeef (or water buffalo) is allowed. The folks at Sneha don’t plan to rock the boat for the moment by offering water buffalo till the air is clear. They are steering clear of anything to do with beef. So for now we can only dream of Sneha’s beef fry and bask in the glory of its win. Mumbai and Kolkata scored quite a few nominations in the final Asia list this year. Taj Sancha ice creams from Mumbai’s Bohri Mohalla and Kolkata’s Fresh and Naturelle of the nolen gurer ice cream fame were nominated in the Tastiest Sweets category. Mumbai also featured through the ukadiche modak from Aaswad in Dadar which got nominated in the Tastiest dumpling category while the Lucknowi mutton biryani from Mumbai’s Kakori House got nominated in the Tastiest Rice category. Kolkata’s Blue Poppy pork momos in Tastiest Pork made it to the final pork nominee list while Red Hot Chilli Pepper’s crab claws scored in the Tastiest Crab category. Local city Chief Chowzters gave in their nominations. Then a central team from Chowzter researched and examined these to arrive at the final list of nominees and then the winners.